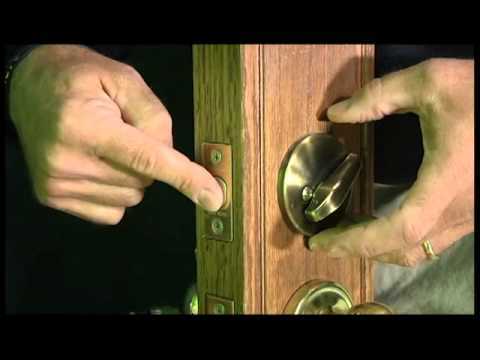 Did you know that you can stop burglars by reinforcing your doors for just $5 per door? That’s right, by going down to your local hardware store and picking up a security strike plate and some 3 inch screws, you can stop a burglar from kicking down your door. I picked up mine this week for $5 at Ace Hardware, and installed them myself in less than 5 minutes. We have had a crime wave in our neighborhood in the past few weeks. Two of my good friends had their front doors kicked in just before Christmas. The burglars were in and out in a hurry, and focused on mostly just stealing the jewelry in the bedrooms. It’s a terrible thing to happen at Christmas, but that’s when thieves know when there are valuables in the home and presents under the tree. This got me thinking about securing our home. How do I stop a burglar from kicking in our front door and breaking into our home? I talked with one of the police officers in our town, and they said most home thefts occur by kicking in one of the doors. Most doors are easy to kick in, even if there is a deadbolt installed. The weakest link of a family’s home security are the tiny screws that are used to install a deadbolt and the strike plates attached to the door frame. These screws are just one inch long and are easy kick in. But if you buy a security strike plate, they come with 3 inch screws that screw deep into the door frame. Watch the video below to see how easy it is to kick in a standard door without a security strike plate, and how hard it is to kick in a door once a strike plate is installed and reinforcing your doors.